I recently won a giveaway from the Bookshelf Gargoyle. I was allowed to choose any book I wanted from The Book Depository. I chose to let Gargoyle Bruce do the choosing for me. Gargoyle Bruce resides on a bookshelf in Australia. I’ve learned a lot about Australia through Bruce’s gargoyley eyes. I asked him to choose a book for me that would be a good representative of Australia. Well, yesterday my book arrived in the mail! And what a fabulously intriguing book it is! This is a colorful story about color and numbers and days of the week and Australia’s infamous Camp Dogs. It begins -“On Monday I walked to my auntie’s house and guess what I saw? 1 yellow cheeky dog sleeping on the floor.” It goes on from there through the days of the week with more and more cheeky dogs being encountered in various activities. On my first read through of this book, I didn’t know what to think. On one paw it was very funny and fun to read. The illustrations are absolutely outrageous! On the other paw, those illustrations are a bit scary. These cheeky dogs are quite menacing! They have big sharklike teeth and sometimes they are chasing things or getting in big fights. But sometimes they are just smiling and playing – on the playground or on the soccer field. I decided I needed to find out more about cheeky camp dogs. And about this book! It turns out that the term “camp dog” is used to describe groups of “motley” dogs that hang around Aboriginal communities all across Australia. The term “cheeky” is used for those camp dogs that tend to be aggressive. You can find out a little more about camp dogs HERE. So, there’s an interesting history behind the cheeky camp dogs, but there is also an interesting back story to the book as well. The illustrator is indeed a remarkable young man who has overcome a great deal to achieve a great deal. Mr Beasley is an Aboriginal gentleman living in the Northern Territory of Australia. He has muscular dystrophy and is profoundly deaf. His disability support educator in school, Ms Joie Boulter, noticed that Dion liked to draw camp dogs and she encouraged this. His sketch books began to fill up. In 2006 Ms Boulter helped Dion start his own Cheeky Dog T-shirt company. As Mr Beasley’s art career was gaining steam, Ms Johanna Bell, an education researcher, was wanting to create a book about the “lived experiences of remote Indigenous school children.” She found the universal appeal for that book in Dion’s camp dogs. Something that all Indigenous children would be familiar with. 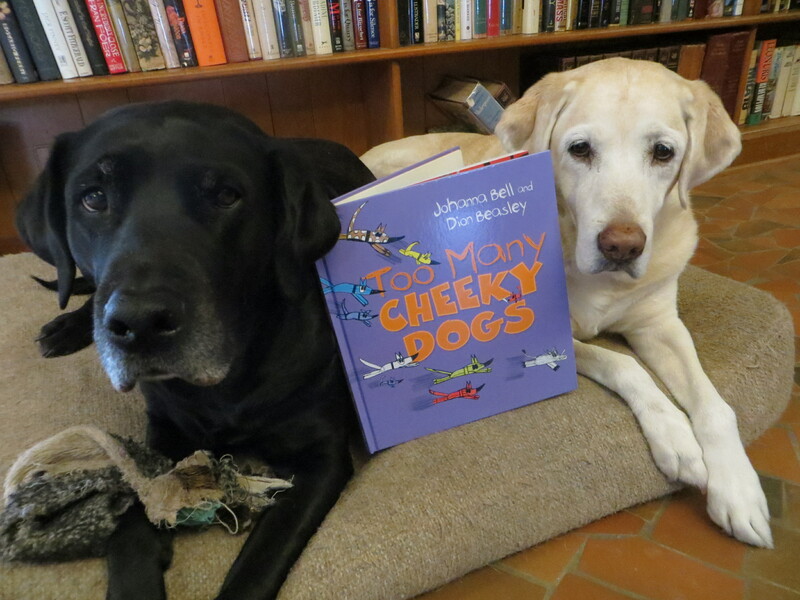 Two years later their collaboration, the book, Too Many Cheeky Dogs, hit the book stores. A side note here — We read this book to our Princesses through Skype and they LOVED it. They did not find those cheeky dogs scary at all. In fact, they have added “cheeky” to their vocabulary. They liked the color and the pictures and guessing what was coming next. All in all it was a good read aloud. 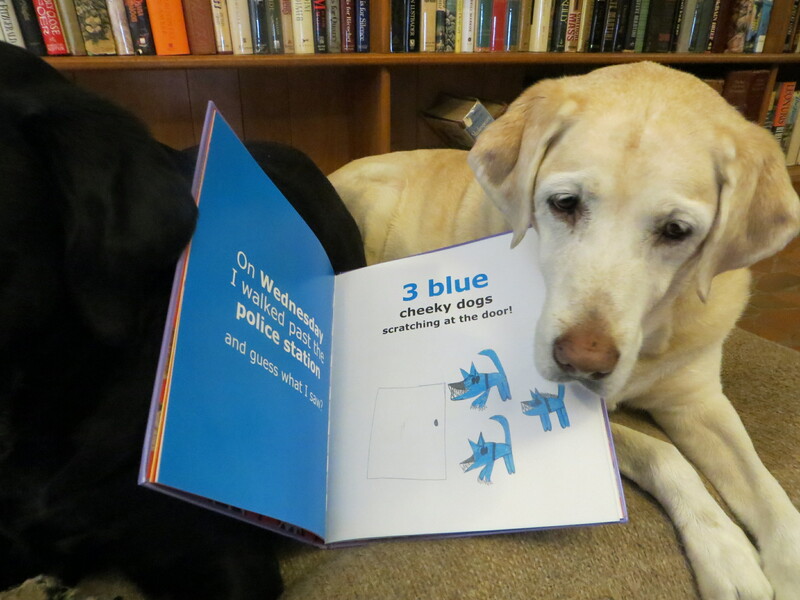 Too Many Cheeky Dogs has a website where you can find out more about the back story, the author and the illustrator. They also have teacher resources and links. You can read more about Dion Beasley at his T-shirt website HERE. Now, to go along with my treasure that came in the mail, I found out from another blogger, Jo at Daily Life of a Guide Dog Team, that today, Sunday, January 26, as I write this post, is Australia Day! How serendipitous! And tomorrow, Monday, January 27, is Multicultural Children’s Book Day! Valarie Budayr at Jump Into a Book and Mia Wenjen at Pragmatic Mom have created this event to promote children’s books that celebrate diversity. I think that this book, my treasure from the mailbox, Too Many Cheeky Dogs, fits in with both of these excellent events. So Happy Australia Day! And follow the links to Multicultural Children’s Book Day and find some fabulous reading material! And check out Too Many Cheeky Dogs!! A fascinating, funny read! Thank you Mr Bruce!! Happy Reading to all you “cheeky” readers out there!